The watershed covers approximately 53,000 acres across eastern Dallas and western Polk Counties. 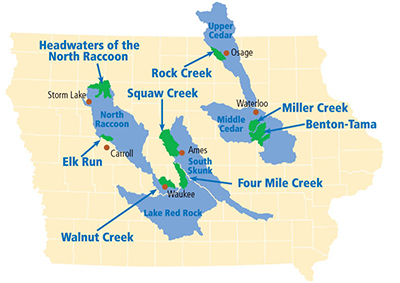 Walnut Creek generally drains from northwest to southeast, meeting the Raccoon River near downtown Des Moines and includes Dallas Center at the western end. The watershed includes some of the most rapidly urbanizing area in Iowa. Water quality concerns that have been identified include nitrate, phosphorus, sediment and pathogens. Urban and rural leaders have been working to cooperatively engage in watershed planning and management through the Watershed Management Authority (WMA). The WMA provides a mechanism for cities, counties, Soil and Water Conservation Districts (SWCDs) and stakeholders to work together. The following entities are voting members: Polk County, The Cities of: Clive, Dallas Center, Des Moines, Grimes, Johnston, Urbandale, Waukee, West Des Moines, Windsor Heights; and Dallas and Polk SWCDs.